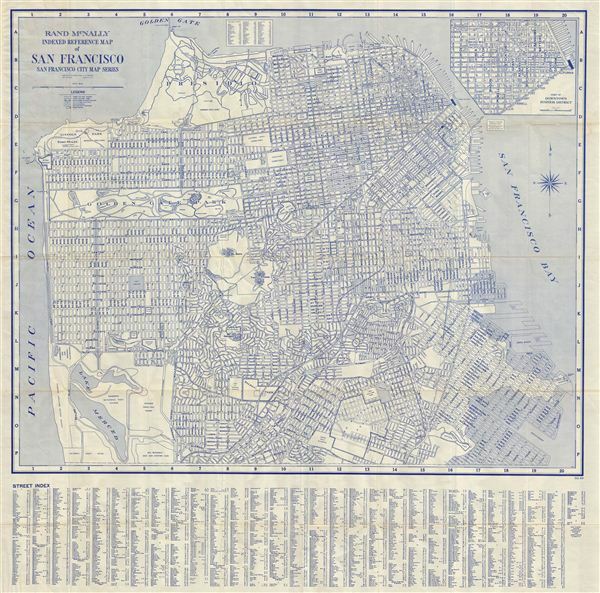 A c. 1940s folding map of the city of San Francisco by Rand McNally shows all major streets, parks, cemetery, squares and peaks. It covers San Francisco from Fort Point (Golden Gate Bridge) in the north to Lake Merced in the south and from the Great Highway in the west to Waterfront Street in the east. The top right corner of the map contains an inset of the Downtown Business District. Shows a large proposted land fill around South Basin and Hunter's Point. The map is highly detailed with a legend on the top left corner. A street index is listed on the bottom of the map. This indexed reference map of San Francisco was published by Rand McNally and is part of the San Francisco City Map Series. Very good. Closed verso repair extending approximatly 2 inch from right top margin. Similar verso repair, from bottom right margin, extending into index. Original fold lines. Blank on verso.